Helen Evelyn Brooks, daughter of William Joseph Brooks and Emergene Howell, wife of Jack Dempsey. Helen Evelyn Dempsey, 61, of Macedonia Road, Kingston, died Monday, January 3, 1994. 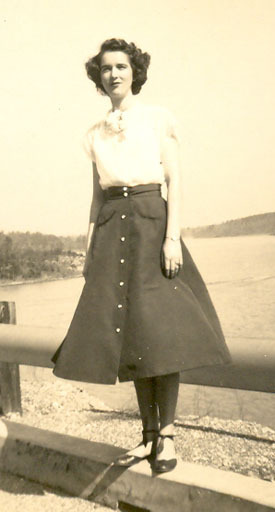 She was born July 4, 1932 in Bartow County, a daughter of Emergene Brooks and the late W.J. Brooks, a homemaker and a member of Center Baptist Church. She was preceded in death by her father, William (Bill) Brooks in 1971 and a son, Mark Brooks Hobbs in 1980. 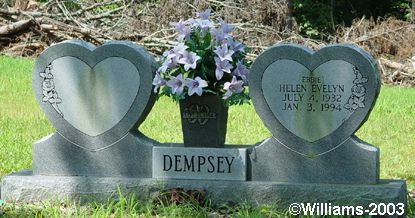 Surviving are her husband, Jack Dempsey, to whom she was married September 29, 1984; her mother Emergene Brooks; sisters, Mrs. L.C. (Billie) Smith, Mrs. Lewis (Marion) Tidwell, Mrs. Lamar (Doris) Thacker, Mrs. Claude (Shirley) Worley Jr.; and her brother, Martin Brooks, all of Cartersville. Funeral services will be held Wednesday, January 05 at 2 p.m. from Center Baptist Church with the Rev. Bill McStotts officiating. Burial will follow in Old Macedonia Cemetery. Pallbearers will be nephews, Lewis Smith, Kenneth Smith, Greg Thacker, Chris Tidwell, Mitchell Worley, Ron Dempsey, Jerry Dempsey, Chris Ross and Greg Dempsey.